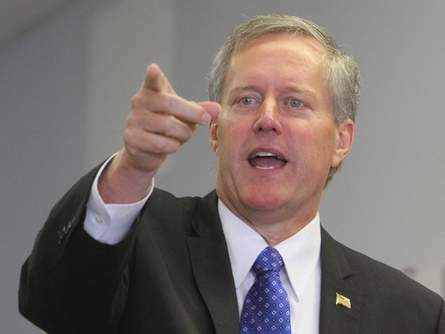 Mark Meadows is my congressman. I say that with a deep sense of shame and frustration. He is somewhere to the right of Attila the Hun and not quite as modern. Meadows leads the Freedom Caucus, which believes in nothing more than its freedom to take basic rights away from the rest of us. It was Meadows who inadvertently saved us from Trumpcare by refusing to vote for it because it didn’t take away enough. It left mandates for coverage of mental illness and addiction, and Meadows objected to that. Meadows has no respect for human life, although he calls himself “pro-life” and “Christian,” even though the only life he supports (other than his own, of course) is that of the fetus, and the last time he followed any of the teachings of Christ — well, I don’t know when that might have been. He is an advocate of taxing the poor, not raising their wages and not giving them food, shelter or health care. He sees public education as a form of welfare, and he wants all forms of welfare abolished. So, why is such a despicable character still in office? OK, so we just give up? That’s it? This last time we put up a pretty good candidate, a retired engineer who was born and raised here, a man whose name invokes history, Rick Bryson, of the Bryson City Brysons. And you know what? We didn’t because we went into it believing we would lose and we were unwilling to fight. This is why I considered leaving the party. I’m damn sick of this we-can’t-beat-them attitude. Damn right we can’t beat them, not unless we actually try. Bryson called Meadows out on his misogyny and on keeping a sexual predator on the payroll for months after the man’s aggression was made public, but his voice was barely heard because it costs money in this climate to have any voice at all. But that’s not enough. We have to call him out on his claims of being Christian and pro-life because he is neither. I’m not good at raising money. It’s just not a talent I possess. But I am good at calling people out on hypocrisy, and Meadows is about as hypocritical as it gets. Meadows claims to follow someone who told us to feed the hungry, care for the sick, visit people in prison and love one another. He shows no evidence of doing any of those things. Two years ago, I went to one of his town halls. I was the second person in the door and I was told I had to write down my question. So I asked whether he was planning on fixing the flaws in the Affordable Care Act, you know, since he was a follower of Christ, who instructed him to care for the sick. I was told the questions would be asked in the order they were submitted, good or bad. My question was submitted second and eight questions were asked. Mine was not among them. So I walked up to Meadows afterward to ask him why he lied, but I never got the chance. I got as far as introducing myself and he said, “Oh, I know who you are,” and he turned his back to me. He knows I’m the woman who lost her son to a broken health care system, but he doesn’t care about that. He cares about getting more money for himself and his cronies and the rest of us can die for all he cares. This is my Congressman and I’m supposed to shrug and say, “Oh well, we can’t beat him.” Really? There has to be someone in the 11th district who has the know-how to do this. Gerrymandered or not, it can be done. We ousted Tim Moffitt from the North Carolina House in 2014, even though we were told it was impossible. The district was gerrymandered and there was a ton of money behind Moffitt. He was next in line to be speaker of the House. But Brian Turner and his volunteers made calls, knocked on doors, held town hall meetings — in short, we worked our butts off. And we won. It can be done. We don’t have to settle for such an immoral man. Meadows does not represent us; he represents the people who fund him. We can do this. We can defeat him. We should at least try.